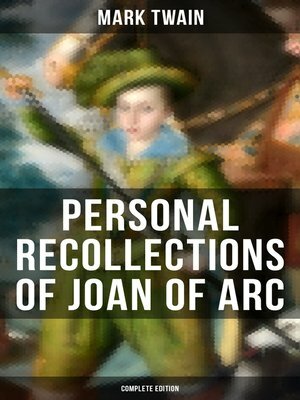 Personal Recollections of Joan of Arc is a historical novel presented as a translation of memoirs by Louis de Conte, a fictionalized version of Louis de Contes, Joan of Arc's page. The story is divided into three sections according to Joan of Arc's development: a youth in Domrémy, a commander of the army of Charles VII of France, and a defendant at trial in Rouen. Samuel Langhorne Clemens (1835-1910), better known by his pen name Mark Twain, was an American writer, humorist, entrepreneur, publisher, and lecturer. He is best known for his two novels – The Adventures of Tom Sawyer and its sequel, the Adventures of Huckleberry Finn, but his satirical stories and travel books are also widely popular. His wit and satire, in prose and in speech, earned him praise from critics and peers. He was lauded as the greatest American humorist of his age.